Mixing embellishment techniques can create spectacular results. The typical corporate identity goal of the past has morphed into a much more fashion forward statement. While the appeal of logoed garments started out with the goal of creating a unified and consistent corporate identity, companies no longer want that identity to match that of their competitors. Companies are finding it essential to stand out from the pack and for many, multi-media embellishment options have proven to be incredibly successful. There are many options outside of the techniques discussed in the article such as foiling, direct to substrate printing, embossing, transfers, sublimation and screenprinting, but owing to space constraints, I am concentrating on appliqués, laser cutting and engraving, sequins, soutache, puffy foam and chenille. Applique, the addition of a separate piece of fabric to act as a section of your design, is the most popular technique employed in embroidery for many reasons. It is easy, doesn’t require any additional equipment, has a very rich polished look, and it can save you money in the long run by significantly reducing the manufacturers production time. Even though it requires time to lay down the appliqué piece or pieces along with the additional expense of having them pre-cut, these expenses are easily offset by up to an 80% reduction in stitch count. This is also a great alternative because manufacturers who offer this option are readily available. The most exciting addition to the world of embroidery in recent years is laser cutting. 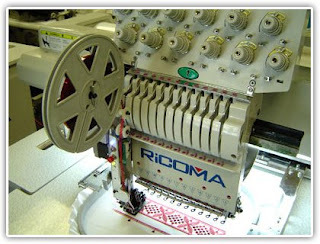 While lasers have been used to cut appliqués before they are applied to the garment, the new beam lasers actually cut the appliqué on the garment itself during the embroidery process. They can also be adjusted to etch the surface of the fabric to match any artwork or photograph. This opens up the doors for more elaborate and detailed appliqué shapes as well as the addition of etched graphics which can take your logo or design in a much more multi-leveled and textural direction. While sequins might initially seem to be an unlikely fit in the corporate identity world, there are many appropriate applications in conjunction with fundraisers, events and customer giveaways. Sequins add a unique high-end look to caps and bags. A few sequins can spice up a design and because they can take the place of thousands of stitches, reduce its cost. Sequins can also transform to most mundane design into a great attention grabber. Soutache or cording is applied to the embroidered design through the addition of a cording foot. It can be used to create three dimensional lettering or to add dimension and texture to areas of your design or logo you wish to emphasize. It can only be used to create very simple shapes but when paired with standard embroidery you can achieve fine detail and rich texture. Puffy foam is a thin layer of foam that is laid down before the design is stitched out. Designs need to be specifically digitized for this process, as the needle penetrations perforate the foam as the stitches cover it, trapping it under the areas of your design you wish to elevate or raise up above the surface of the design. The remainder of the foam is torn away leaving only the pieces enclosed under the embroidery. This is a great way to make a logo gain prominence with a design. Remember, however any design created with foam can not be dry cleaned as the fluid will melt the styrene foam. Texture has always been the major draw to embroidery, but the traditional textural techniques alone can make your logo all too similar to your competitor. This is where Chenille comes in. Chenille is created using two different stitches; chain and moss. The moss stitch consists of loops of yarn, and the chain stitch is a flat stitch primarily used to make the edges of the moss stitch look neater and more consistent. Chenille has always been a specialized sector of the embroidery industry, which makes it more difficult to find a supplier. Corporations, schools, teams, fashion designers, organizations, fraternities, sororities, clubs, individuals, movie studios, Grand Prix and Motorcross, pop and country music stars, and sporting goods team dealers all use chenille embroidery and the demands are greater than the services available, so if you decide to go this route make sure the manufacturer can fit your needs and time frame. While choosing to combine various embellishment techniques is usually a design decision, the combination of other decoration techniques with traditional embroidery can also make the product more cost effective. Embroidery is the most costly embellishment technique, by replacing portions of your design with less expensive options you can reduce the production cost of the entire process. When deciding on a multi-media design, you should start by considering your options. Then it is necessary to find an advertising specialty distributor or embroider with a knowledge of the processes and access to the equipment to produce the desired embellishment combination. Last you need to make sure that the cost is justified and fits within your budget. Endless multi-media combinations continue to be increasingly available, so it is easy to choose the combination that works best for you. Labels: Mixing embellishment techniques can create spectacular results. If you enjoy technology, you may be interested in following the advent of I-Cliqq Professionals Embroidery Software.